Reducing CO2 emissions and restraining dependence on nuclear power generation are serious concerns in the prevention of global warming since the Great East Japan Earthquake. To do so, it is necessary to use and expand green energy such as solar energy and to promote energy conservation. However in high-latitude regions, it is difficult to directly and effectively use solar power due to on insufficient amount of solar radiation. 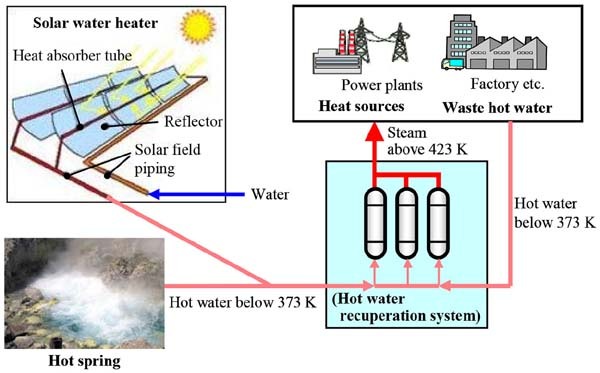 If steam can be generated from warm water at less than 373 K, it is possible to obtain steam by solar water heaters from weak solar radiation, hot springs and industrial waste warm water without the consumption of any fossil fuels. In this study, the authors have been developing a system which generates steam over 423 K from warm water at less than 373 K using an adsorption heat pump with a zeolite. Therefore, improved bench-scale equipment which generates steam continuously and the experimental results are mentioned. The Japanese government has lowered its CO2 emissions reduction target in November 2013, however the trade deficit in 2013 enlarged to 13.7 trillion yen with fossil fuel imports reaching 28.4 trillion yen and the total imports of 84.6 trillion yen. These values indicate the need as a nation to reduce energy imports not only from a CO2 emissions reduction and a restraining dependence on nuclear power generation standpoint, but also from an economic one . Not just the improvement in energy utilization rate across the country, but the introduction of renewable energy is crucial to reducing energy imports. We can get the green power easily by using the photovoltaic power generation and the wind power generation. However, in a high-latitude area, the amount of solar radiation is weak, so the solar energy of per unit area is low. With that, it is difficult to directly use warm water made from solar water heaters at less than 373 K for industries. In addition, if the steam can be generated from warm water at less than 373 K, it is possible to effectively use those forms of energy [2, 3]. In this study, a steam generation system from warm water at less than 373 K has been developed using an adsorption heat pump with a zeolite. And, the experiments have been conducted in a visualized experimental system and improved the bench-scale equipment. The principle of this adsorption heat pump cycle is shown in Figure 1 . In the beginning, we set an initial condition where zeolite is packed in the steam generator (state 1). Warm water flows into the steam generator. Zeolite adsorbs a part of the warm water. Adsorption heat is generated, and the temperature of the steam generator rises to the steam generation temperature by adsorption heat (state 2). After that, warm water flows into the steam generator, and steam is generated by adsorption heat (state 3). Those operations are controlled by pressure. Then, the pressure of the steam generator is decreased (state 4). Water is desorbed by contact of zeolite with dry air, and zeolite particles return to the initial condition. We can continuously obtain steam by repetition of this cycle. The dry air is obtained to dehumidify outside air by a desiccant rotor which is regenerated by the regeneration air after zeolite. Dry air is heated at 393 K by superheated hot water which is generated by absorption heat pump using warm water. For this reason, the proposed steam generation system requires only the power which is used by the measurement control unit, the regeneration air blower and the water warm pump. A visualized experimental system is installed and basic experiments were conducted in order to verify the principle shown in Figure 1. In the basic experiments, we verified adsorption and desorption phenomena. Then we studied bench-scale equipment to develop and improve a scale-up system of the equipment composition, specifications and the operation procedure. Figure 2 shows the outline of the visualized experimental system. The steam generator of the visualized experimental system was made of heat resistant glass which is 250 mm in height, 107 mm in inner diameter and 8 mm in thickness. So, we can observe the reaction of the steam generation. Water flows into the bottom of the steam generator, and zeolite particles were used as a molecular sieve 13 X in the experiments , and the height of the packed bed is 50–200 mm into the steam generator. The measuring temperature points which are the top and middle of the steam generator are shown in Figure 2. The results of the visualized experimental system are shown in the following. The tests of steam generation and regeneration were conducted in the visualized experimental system. The experimental condition and results are shown in Table 1 and Figure 3. As shown in Figure 3, in the steam generation process, steam is generated by contact between the zeolite particles packed in the generator and water flows into the bottom of the generator. The Generated steam pushes the remaining air out of the voids between the zeolite particles, and it is adsorbed by upper zeolite particles. Such a phenomenon confirmed that the zeolite temperature rose without any contact with water. The temperature of the upper zeolite particles rises to accompany the elevation of the water level, because a part of generated steam is adsorbed at upper zeolite particles. So, the remaining steam which is not adsorbed is superheated by high temperature upper zeolite particles. Therefore, high temperature steam is generated. When the water level reaches the middle section of the packed bed, all air is pushed out of the zeolite packed bed and the result is only steam. This phenomenon confirmed that generating air bubbles from the steam trap vanished, because all of the evolved gases changed into water by cooling. The maximum steam is generated at the water level below 5–10 mm from the top of the packed bed. In the regeneration process, dry air blown into the top of the steam generator and is discharged from the bottom of the steam generator. The drying pattern of the zeolite particle surfaces was observed, and the zeolite particles were evenly regenerated in a circumferential direction from the top of packed bed to the bottom. The relation between generated steam conditions which are quantity and the average temperature, and packed bed thickness are shown in Figure 4. In the Figure 4, the average steam temperature is measured at the upper part of steam generator and verified the temperature rising of the water temperature in steam trap. The zeolite temperature was measured at the 50 mm below from the zeolite upper surface, and the generated steam quantity was evaluated by the changes in the weight of the steam trap. As shown in Figure 4, the generated steam quantity is increased according to the increase of the backed bed thickness. However the increasing rate is not proportional to increasing of the backed bed thickness, it is larger than increasing of the backed bed thickness. And also, it is clarified that the average steam temperature is increased according to the increase of the backed bed thickness. This phenomenon is considered that the adsorption time of the steam at the upper zeolite particles are longer according to the increase of the backed bed thickness. Therefore, the steam quantity and temperature is increased at the same time when the packed bed thickness is caused to rise, because not only the superheated zeolite particles are increased, but also the temperature of zeolite zeolite particles is increased contributing the steam generation. As the results, it is necessary to increase the packed bed thickness obtaining the necessary temperature of 423 K. It is required the packed bed thickness of 180 mm or more to increase the steam temperature from 413 K  to 423K. Furthermore, it is clarified that the amount of steam generation per unit time is able to obtain the same quantity when the cycle time is increased twofold according to the increase of the backed bed thickness from 150 mm to 180 mm. The bench-scale equipment which was scaled up system was improved based on the results of the visualized experimental system, and the operating condition and the results are shown in the following . 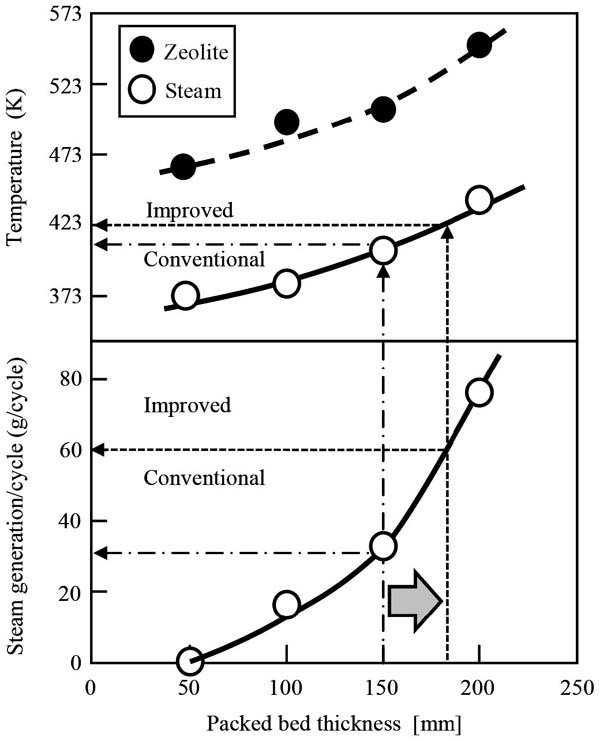 In order to continuously generate steam, the bench-scale equipment is operated alternately switching between three steam generators at each process as shown in Figure 5 . An outline of bench-scale equipment with three steam generators is shown in Figure 6. 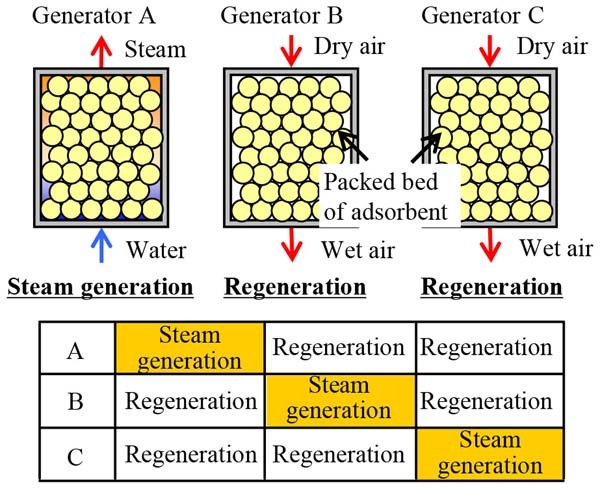 As shown in Figure 6, the bench-scale equipment consists of the steam generation system and the regeneration air system. The regeneration air system consists of a desiccant rotor for dehumidification and as absorption heat pump for heating the air . 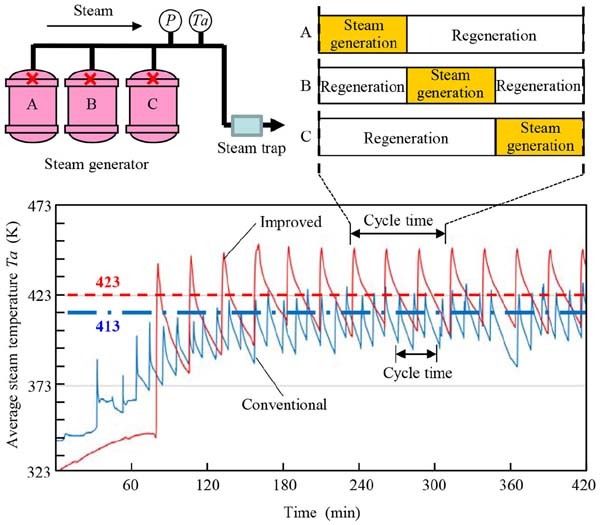 The conventional each process time was determined by the labo-scale experimental results  in which the steam generation process is 10 min and the regeneration process is 20 min. The regeneration process is divided into halves. In the first half, regeneration air through zeolite is used in pre-heating and in the second half regeneration air through zeolite is used in regeneration for the desiccant rotor, and the air is exhausted. Consecutive experiments of steam generation were conducted in the bench-scale equipment with three steam generators. The experimental conditions are shown in Table 2 and Figure 7. In Figure 7, the packed bed thickness of the conventional test was 150 mm, and that of improved test was more than 200 mm. As a result of the bench-scale equipment, the maximum steam temperature at Ta which is collection part is increased from 433 K to 453 K according to the increase of the backed bed thickness based on the experiment results mentioned above section 4. Therefore, the average steam temperature at Ta is increased from 413 K  to over 423 K. For the future, we plan to raise the steam temperature, optimize the reduction of pressure loss at the zeolite packed bed and the amount of regeneration air, and develop a scale-up system to be used for practical applications. 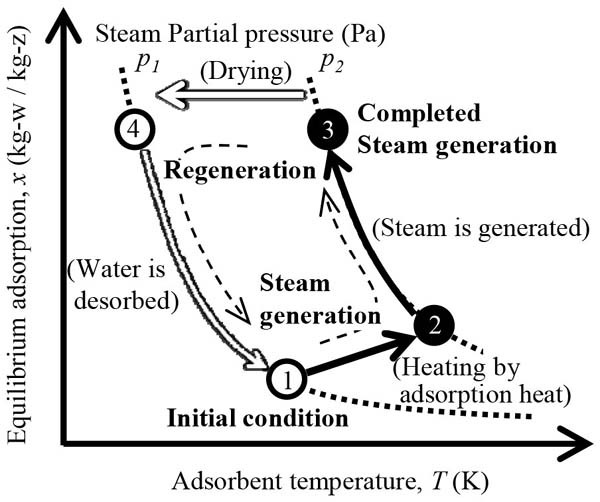 As an example, in high-latitude regions, a practical realization of the adsorption steam generator is shown in Figure 8. The amount of insolation in high-latitude regions is low, so water is not sufficiently heated. However, warm water is obtained at less than 373 K by simple equipments . If the water which is generated by using solar thermal energy is superheated by the adsorption steam generator system, it is possible to use the generated steam as the power source of the steam turbines in power plants and the process steam in factories. Furthermore, there is a large amount of warm water which is exhausted from hot springs, steel-works and petrochemical process at less than 373 K, it has not been reutilized. On the other hand, reducing CO2 emissions is a concern in steel-works. In Japan, an amine process has been developing on COURSE50 National Project, and it is a technology which separates CO2 from blast furnace gas [11, 12]. If the steam generation system will be applied to the amine process as the heat source, the warm water as the waste heat can be recuperated in the amine process without energy consumption. A steam generation system from warm water at less than 373 K has been developed using the adsorption heat pump with a zeolite. And, the experiments have been conducted in a visualized experimental system and improved the bench-scale equipment. As a result, the maximum steam temperature at the collection part is increased from 433 K to 453 K according to the increase of the backed bed thickness and an average temperature of over 423 K could be generated continuously. Moreover, this steam generation system is applicable to not only the solar thermal energy which is applied in high-latitude regions but also the unutilized geothermal energy such as a hot spring. The developed steam generation system has a high versatility that the steam can be recuperate the waste warm water discharging from power plants and factories. We would like to express our gratitude to NEDO (New Energy and Industrial Technology Development Organization) for their financial support. T. Nakagawa, High efficiency energy recuperation through the use of gas separation, Journal of Japan Society of Energy and Resources 32 (4) pp.1–8, 2011. 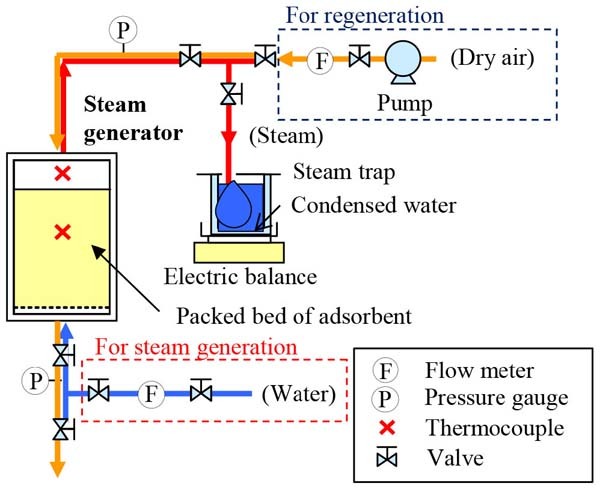 K. Nakaso, E. Oktariani, A. Noda, Y. Itaya, T. Nakagawa, J. Fukai, Development of adsorption heat pump system for regenerating high temperature steam: Basic concept and estimation of effective utilization of energy, Journal of Japan Society of Energy and Resources 32 (5) pp. 9–16, 2011. The Society of Chemical Engineers in Japan, Chemical Engineering Handbook, Maruzen, Tokyo, pp. 692–693. (in Japanese), 1999. 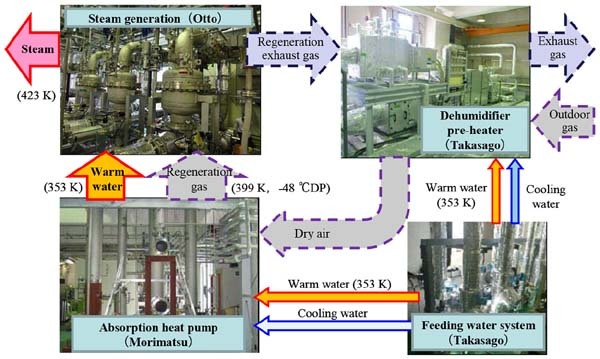 T. Nakagawa, T. Nishi, Y. Notoji, Y. Kawakami, M. Tanino, Y. Abe3, K. Ito, K. Marumo, T. Aoyama, Y. Itaya, K. Nakaso, Jun Fukai, Development of Adsorption Steam Generator without the Fossil Fuels Consumption, Journal of Energy and Power Engineering 8, (decision of publication), 2014. Y. Kawakami, Y. Abe, K. Ito, K. Marumo, T. Aoyama, M. Tanino, et al., Development of Bench-Scaled Adsorption Type steam recovery system for generating high temperature steam from hot waste water, in: American Insutitute of Chemical Engineers Annual Meeting, San Francisco, United States, Nov. 3–8, 2013. K. Marumo, T. Aoyama, N. Kobayasi, Y. Itaya, Lithium Bromide-water absorption heat pump system for heating up air from waste heat, in: American Insutitute of Chemical Engineers Annual Meeting, San Francisco, United States, Nov. 3–8, 2013. 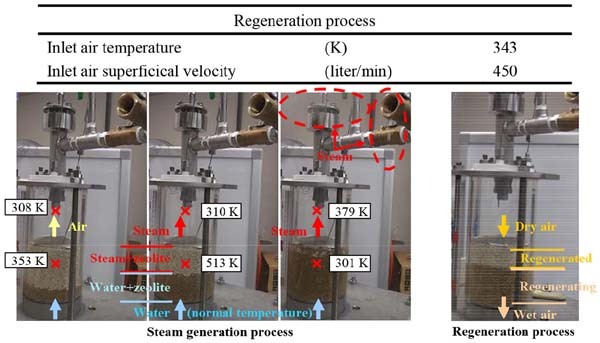 E. Oktariani, K. Tahata, K. Nakashima, A. Noda, B. Xue, A.T. Wijayanta, et al., Experimental investigation on the adsorption process for steam generation using a zeolite-water system, Journal of Chemical Engineering of Japan 45 (5) pp. 355–362, 2012. T. Yoshida, Front line of effective Solar Energy utilization, pp. 409–440, NTS, Tokyo. (in Japanese), 2012. M. Onoda, Recent CO2 capture technology, Journal of Japan Institute of Energy 88 (4) pp. 278–283, 2009. Nishi Takahiro is a graduate student of Okayama Prefectural University, Japan. He is going to work in Aisin Seiki Co., Ltd. after earning a master's degree in engineering from the University. He is researching on a chemical heat pump system. Yu Notoji is a Project researcher of the Okayama Prefectural University, Japan. He has the Master in engineering. His current research focus is ``Smart PV and EV system'' which is able to build high efficient Smart grid.